"Let's go for dinner at Red Star", exclaimed my parents out of nowhere. Okay, that may not sound much like a new idea since we all know that Red Star is one of the best Chinese restaurants in Vancouver. However, with my parents at least, this was somewhat of a shocking declaration. 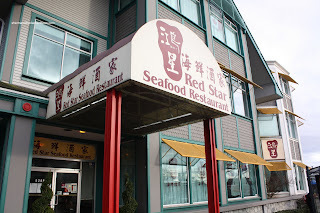 You see, they have been really good customers of Victoria Seafood Restaurant for many, many years. As such, they do not really deviate from the usual very often. Yet, with my constant praises regarding Red Star finally got to them. I do believe they are actually open to going to somewhere other than Victoria for dinner. No offense against Victoria. They do serve up some good Dim Sum (albeit expensive); but their dinner is not really up to snuff in relation to their prices. I think they realize this since they are now charging 20% for their food at the moment. Okay, enough about Victoria, onto Red Star. Alright, lemme get this out of the way right now. For those who want to point out that I just did the Foodie Feast which featured Red Star, I do not expect any preferential treatment and do not want free food. In fact, I made a reservation not in my name. Hence, they didn't even know I was eating there until part way through. And yes, we paid for our meal; but they did give us 10% off. Also, some of the pictures are from a previous visit since they look much better (due to lighting, not the actual final product). So there, enough with the disclaimers... Onto the food! 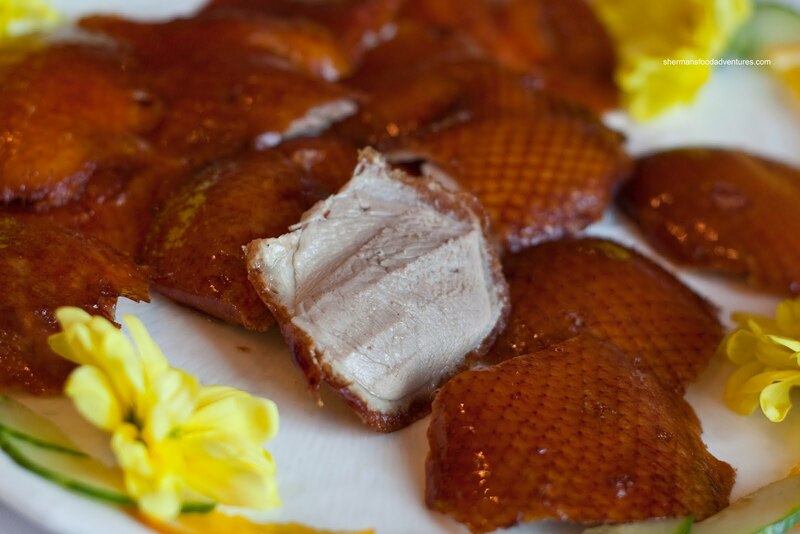 We started with the Peking Duck (2 courses). 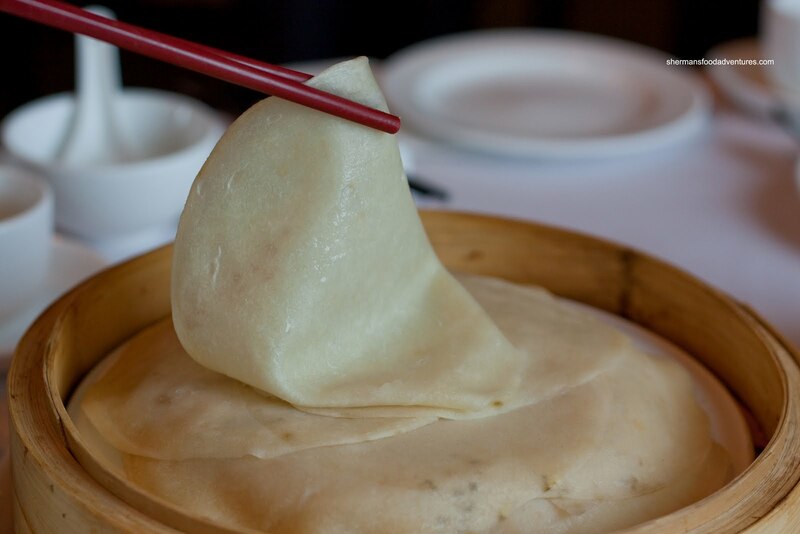 One thing that you'll immediately notice is the relatively thinner layer of fat with the Peking Duck. The reason for this is that the duck is specifically raised for Red Star. Hence, the skin will be more meaty; rather than fatty. Still not healthy; but a bit better nonetheless. The second course of Peking Duck was the Duck Lettuce Wrap. That's what they do with the rest of the duck meat once the skin has been carved. 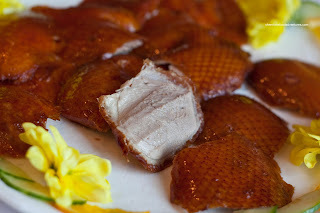 In some instances, some restaurants offer a third course consisting of a duck bone soup or a thick soup with duck meat. The lettuce wrap was prepared really well. The components stayed crunchy with no residual liquid at the bottom of the plate. A clear indication of enough wok heat (or wok hay). One dish I wanted my parents to try was the Modern Fried Rice which employs wild rice rather than the standard white rice. Added into the mix are chicken, celery, egg, crab meat and compoy. This is no ordinary rice in terms of ingredients and price. What I like most about this fried rice is the texture. 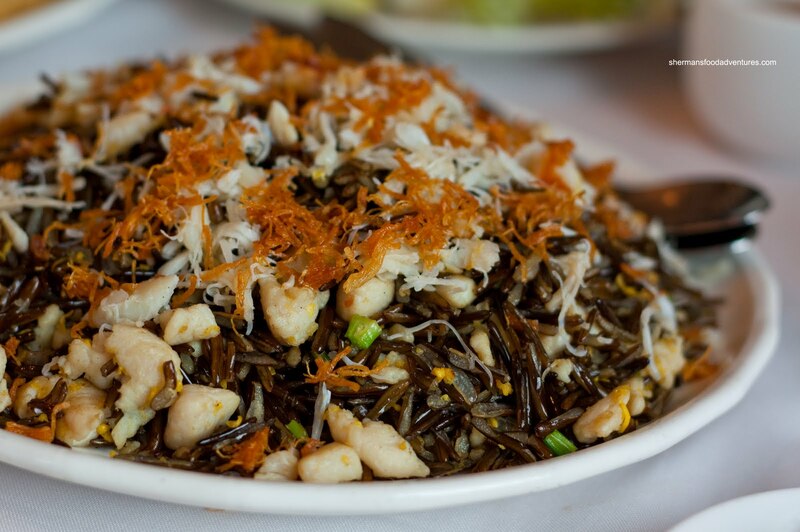 Unlike regular white rice, wild rice is chewier and does not clump up. 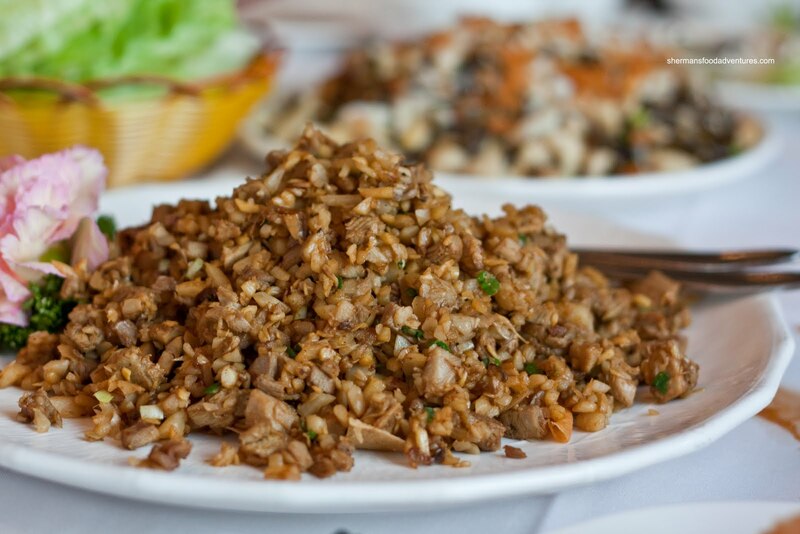 This results in a drier fried rice that has plenty of texture. Add in the premium ingredients and there you have a CRA winning dish. My dad particularly liked it since it was "healthier". 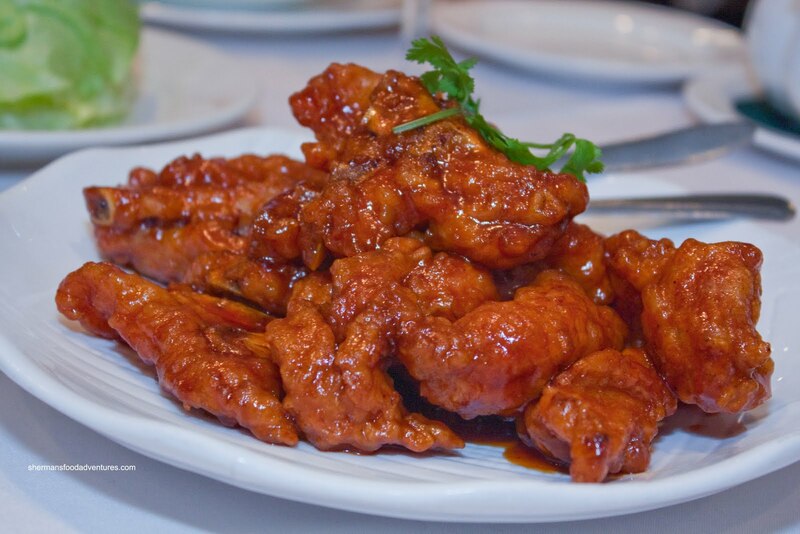 If any Chinese food can be considered healthier, I guess it is a bonus. So I guess it was fitting that our next dish was not exactly a low-calorie item. Typically, Peking Pork Chops are fatty and deep-fried. These were pretty much that; however, these were done properly. 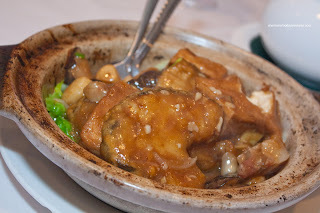 The pork was tenderized to the point it was very easy to chew while still retaining a meat texture. The sauce itself the right thickness where it clung to each pork chop without leaving a watery mess at the bottom of the plate. The flavour was well-balanced with a good combination of tart, savoury and sweet. A well-executed dish. Duck skin and fried pork chops, not necessarily part of a low-calorie diet. Hence we got some fish. I guess it didn't hlep that it was fried as well. 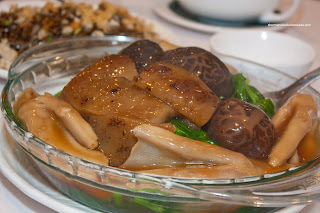 The Black Cod Hot Pot consisted of several large pieces of cod with whole garlic cloves, shiitake mushrooms and roast pork. The fish was cooked perfectly. It was moist, flaky and stay intact mostly when picked up. Just the right amount of starch-thickened sauce coated each piece. It was garlicky and rich. For our last dish, we got the Pea Shoots with sea cucumber, shiitake mushrooms and goose webs. The pea shoots were really fresh and high quality. They were cooked perfectly being tender while still having a crunch. I liked how there wasn't a pool of water at the bottom of the plate. This is a clear indication they did not water blanch it first. Furthermore, that also means there was good wok heat as well. The one thing that could've been better with this dish was the preparation of the webs and sea cucumber. I found them a smidgen underdone. Call it personal taste, I like them to be on the softer side. Other than that, the meal as a whole was very good. While we were there, the place was packed from start to finish. This is no coincidence. Compared to meals I've had recently at Kirin City Square and Victoria, there is no contest as to which one is better.